The final round of the World Chess Olympiad in Batumi, Georgia, is now completed! Spanning 11 rounds over 12 days, it was a grueling schedule even for the most experienced players. Many games would last 4 hours, and some even longer. The Ugandan women's team ended up dropping their final match to South Africa 1.5-2.5;. In spite of this loss, they ended up tied for 84th place (96th on tiebreaks), while they started the event ranked 114th out of 150 women's teams. The BIG and AMAZING result this Olympiad revolves around Gloria Nansubuga. As a 5 year old, Gloria taught 10 year old Phiona Mutesi how the chess pieces moved on Phiona’s first day in the SOM Chess Academy (as depicted in Disney’s Queen of Katwe live-action movie). This year, Gloria was called up to participate in the qualifier for the Olympiad because of a last-minute drop. She was not expected to perform highly, yet she qualified in that match to be one of the 5 ladies on the Ugandan Olympiad team. In the Olympiad she scored the highest of her team mates, winning 6.0 out of 9 games played, and gaining over 100 ELO (rating) points! Not only this, but her performance has earned her the Women's FIDE Master title! She is the FIRST Ugandan lady to earn this title based on results in a World Event! In August 2016, I had the chance to travel to Kampala, Uganda, to coach the Uganda Women’s Olympiad team as they prepared for the 42nd Chess Olympiad. While there, I met Gloria for the first time. In the picture below, Gloria, Sarah Katende (wife of Robert Katende, founder of the Robert Katende Initiative), and I were visiting Gloria’s aunties. The boards on the left side of the picture are her aunties’ home- a 6’ x 6’ dwelling. Gloria’s impoverished background makes her successes all the more inspiring. In other Olympiad news, the US men's team tied for first with China but took silver on tiebreaks. This is just the opposite of 2 years ago where US and China also tied, with US taking gold on tiebreaks. This year, China won gold for both the men's and women's teams! China’s Men’s and Women’s teams take gold! I left the Olympiad Thursday morning (the last round was Friday). Three flights, two layovers, 20 hours, and 10,000km later, I arrived in Pittsburgh in time to participate in Chess Week events. Friday, 10/6, I visited a school chess club in Pittsburgh with Ashley Priore. Ashley’s list of accomplishments is impressive: Starting a non-profit The Queen's Gambit Institute, catalyzing a movement around chess that resulted in the official annual Pittsburgh Week of Chess, giving a TEDx talk, and now starting college at the University of Pittsburgh - yes, that's right, she's all of 18 years old and already making great steps forward to lead social impact through chess. I had a good time working with a few students, playing a blindfold chess game, working with students on a few strategies, and sharing about the Mindsets of Success such as are featured in my new book A Pawn's Journey. As part of the event, I gave the students Chess4Life wristbands with the Chess4Life motto "Win.Draw.Learn." engraved on them. I’m looking forward to tomorrow's tournament, simul, and book signing event at the University of Pittsburgh! PS - Look for a special announcement next week with A Pawn's Journey official book release on Tuesday Oct 9th! Update from Batumi: World Chess Olympiad- Team USA vying for top placement! It's been a busy few days since the last update. I’ve been reviewing games in order to help participants learn, preparing for next games by looking up opponent's likely opening choices, and considering the mindset of each player before suggesting what to focus on. I still managed to get some personal time in: touring the area, visiting a waterfall, walking on the wall of a really OLD fort (originally part of it was built about 2,500 years ago!! ), and riding the cable car to get some great views of the city! 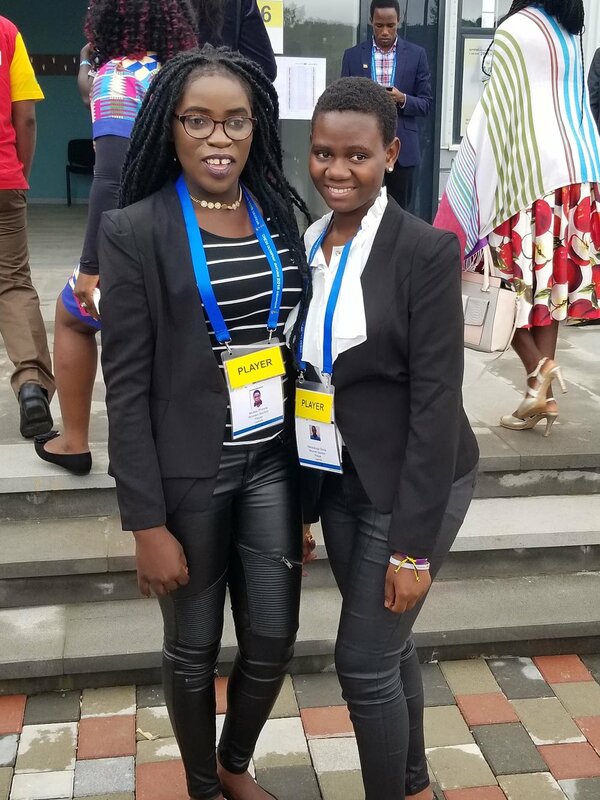 The Ugandan Olympiad women's team has had their ups and downs. Right now they are tied for 84th place. They started the event ranked 114th. Gloria Nansubuga, who as a 5 year old taught Phiona Mutesi how the pieces move (As shown in Disney’s Queen of Katwe) is here now at her first Olympiad and is leading the Ugandan team with 4.5 points! To view the standings of the Uganda Women’s team, just click on this link. The USA Men's team is vying for 1st place. They came into the lead after an exciting 8th round match, defeating the first place Azerbaijan team, resulting in US in first place by half a point with 3 rounds to go. While the whole team has been performing extremely well, special mention goes to Fabiano Caruana, who has had no losses and a very strong showing on board 1 (scored 4 wins and 3 draws with a performance rating over 2900!). This is a very good warm-up for the FIDE World Chess Championship Match in London in November when he takes on Magnus Carlsen of Norway, the reigning world chess champion. To view the standings for team USA just visit this link. While here in Batumi, I was intervewed for the Perpetual Chess Podcast hosted by Ben Johnson. Ben asked about my experiences at the Olympiad, my reasons for starting Chess4Life, and the stories behind my new book, A Pawn’s Journey. Speaking of this, if you have already read my new book A Pawn's Journey: Transforming Lives One Move at a Time, please do consider writing a review on Amazon. Additional reviews and comments are VERY much appreciated, whether positive or critical! If you haven't picked up a copy yet, feel free to click here on options for ebook, self-narrated audiobook, or pre-order the physical book (launching next week!). While at the Olympiad, I had lunch with Robert Katende, founder of the Queen of Katwe project in the slums of Katwe and surrounding areas. I gave him one of the first copies of my new book, as his work continues to inspire me. You can see some of what is happening by visiting the Robert Katende Initiative website, or following them on Facebook, as he works to serve many thousands of students in Eastern Africa as well as around the world! I hope to share more on this in a later post. PS - if you happen to be in one of the areas I'm doing some special appearances, I would love to see you! Check out this link for a list of my upcoming events. It’s been an exciting time so far in Batumi, Georgia, as I help coach Phiona Mutesi (from Disney's movie Queen of Katwe) and her Ugandan teammates for the World Chess Olympiad. Elliott Neff with the Ugandan Women’s Team: Peninah Nakabo, Phiona Mutesi, Shakhira Ampaire, Gloria Nansubuga, and Christine Namaganda. I'm staying near the coast of the Black Sea. Each morning I take a taxi to the hotel where the Ugandan team is staying. The taxi ride costs just 10 lari (about $4 US). We spend 2 or 3 hours preparing for the next round, going over who the team is playing, ensuring each player is confident on what to focus on in the match. After lunch the players are transported to the playing hall. No cameras or phones are allowed inside. 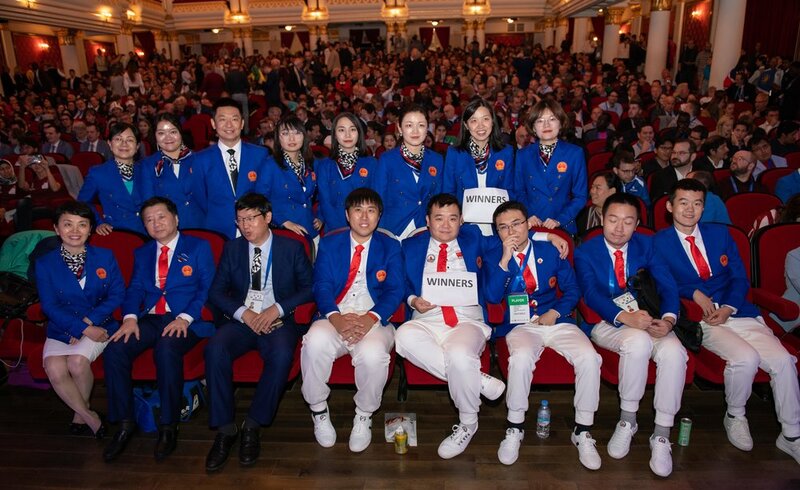 It's quite interesting to see many of the world's best chess players gathered for this one event, with nearly 1,000 players competing each round. Multiple famous players and past world champions are present, including Nona Gaprindashvili. Nona was the women’s world chess champion from 1962-1978, and is from Georgia. Each game can take even 4 hours sometimes! In the evening, the moves played are reviewed to learn from them. Then it’s time for dinner, bed, and back to the routine! The event itself is 11 games with just 1 rest day, so for 12 days the competition continues. So far the US men's team is in a tie for 1st, trying to repeat their gold medal from last Olympiad 2 years ago. At five years old, Gloria Nansubuga (pictured right) taught Phiona Mutesi (pictured left) how to play chess. Now they are teammates in the World Chess Olympiad. Phiona Mutesi, whose story is represented in the book The Queen of Katwe as well as the Disney movie Queen of Katwe, leads the Ugandan women's team on board 1. If you have seen the movie, you may remember the little girl Gloria who teaches Phiona the moves. That little girl in real life is now 18 years old and is now playing on the Olympiad team for the first time with Phiona! In the first round, Gloria scored a draw (tie game) with a player ranked far above her! In the 2nd round, both Gloria and Phiona won their matches, while a 3rd team member was able to hold a draw, achieving their first team win of the event! Comment below with any questions you may have! Also, be sure to check out my new book A Pawn's Journey: Transforming Lives One Move at a Time. Read reviews on Amazon at this link.